The Twentieth Anniversary of the Hornet’s entry into service is seen as an opportunity to celebrate its service record. With such a significant anniversary the RAAF and Boeing applied a special colour scheme to A21-26 to highlight it to the world. The aircraft was unveiled just this week at the Avalon Air Show, held near Melbourne Australia every two years. In conjunction with this celebration a new book on the Hornet in Australian service was launched. 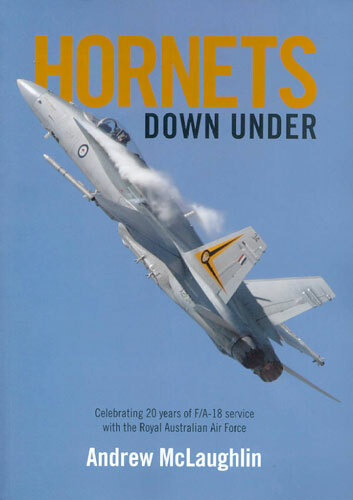 “Hornets Downunder” by aviation journalist Andrew McLaughlin is a comprehensive look at the F/A-18 and the two decades of service the Hornet has given in defence of Australia. Follow this link to see three photos of the 20 Year Hornet anniversary scheme. Andrew McLaughlin has a long history of interest in aviation, as he freely admits to in his introduction to this book. He has also recently assumed the post of Deputy Editor at the magazine Australian Aviation. It is from the perspective of deep interest in the subject that he has put together a comprehensive title. “Hornets Downunder” is not just about Australia, despite the title. McLaughlin puts Australia’s experience with the aircraft in the context of overall development of the Hornet for the US, dating back to the USAF Light Weight Fighter program of the 1970s through to the F/A-18E/F and EA-18G now entering widespread service with the US Navy. With history, development and model by model analysis complete the Australian angle is then addressed. McLaughlin charts the long history of the Next Tactical Fighter Project, which was established to find a replacement for the Mirage IIIO fighter. After many false starts the F/A-18A was selected in 1981 as the RAAF’s newest fighter aircraft. 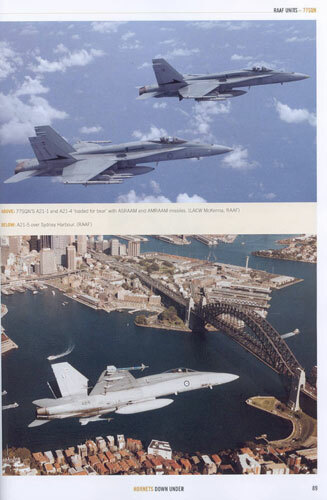 Coverage of the production of the Hornet in Australia and Australian Industry Program associated with it rounds out this section. 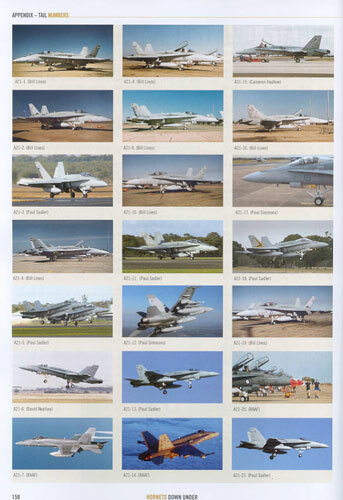 Each RAAF unit that operates the Hornet are then covered in turn, a short history being accompanied by a photo spread of the aircraft in the unique markings applied by that unit. 2 Operational Conversion Unit, 3 Squadron, 75 Squadron, 77 Squadron and the Aircraft Research and Development Unit all receive this treatment. Following this is a brief examination of the RAAF Hornet at war. Operation Slipper (air defence of Diego Garcia during the war in Afghanistan) and Operations Bastille and Falconer (Operation Iraqi Freedom) are dealt with, with a special photographic supplement on the 75 Squadron experience over Iraq. Other areas that McLaughlin covers include exercises such as Red Flag 05-1 and the Hornet’s Australian nests at RAAF Williamtown and Tindal. Rounding all this out is a useful examination of the Hornet Upgrade Program which has transformed the F/A-18As of 1985 to the advanced combat aircraft in service today. Combined with a chapter on RAAF Hornet weapons and one is left with a clear idea of what the Hornet means for the RAAF’s air combat capability. Completing the book are more general references as well as some useful appendices. 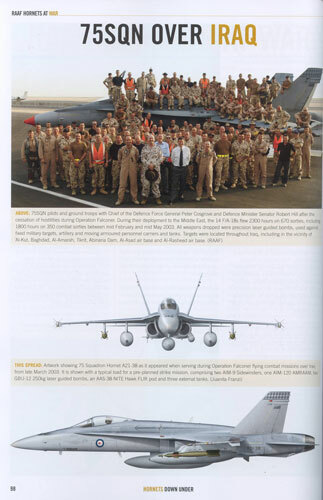 Each other operator of the Hornet including the US, Canada, Spain, Finland, Kuwait, Switzerland and Malaysia get an entry including comprehensive photo coverage which is welcome as clear photos of aircraft from some of these countries are often hard to come by. Some of the almost operators are also dealt with including South Korea, Thailand and France. The appendices include a timeline of Hornet Program Milestones from 1966 and a brief history of all RAAF Hornets from A21-1 to A21-118. Part of this is a photo essay with an image of every Australian Hornet, with the exception of A21-42 which crashed in August 1990, just over a year after its delivery, tragically killing the then CO of 75SQN, WGCDR Ross Fox. The book comprises 164 pages printed on satin paper between cardboard covers. It has been beautifully produced and is obviously a work of great passion for the author. The text is well supported by lavish amounts of large colour photographs many of which have never been published before. In particular the air to air photography of current RAAF Hornet display pilot Paul Simmons is worth the purchase price alone. With the support of the RAAF, McLaughlin has been able to pull together imagery which shows not only the Hornets itself, but the many combinations of ordnance that have been hung off them by the RAAF over twenty years. Also to be found scattered throughout the volume are examples of the artwork of Juanita Franzi of Aero Illustrations, in the form of colour profiles and scrap views of Hornets, Mirages, Sabres and other types as required by the narrative. Juanita has a passion for accuracy and these are indeed very accurate renditions which make a nice addition to the photographs. Twelve years ago Australian Aviation published “Phantom, Hornet and Skyhawk in Australian Service” by Stewart Wilson. A comprehensive work for its time, the intervening years have rendered it dated. Andrew McLaughlin has come along at an opportune moment with “Hornets Downunder”. For aviation buffs, historians and modellers alike this book will be a one stop shop for understanding the RAAF Hornet.